Have a drink in your hands and see views of the city and other parts of NY that you will not be able to see anywhere else but at these rooftop bars. Whether it's hot or cold, these bars are ready to provide you with the fun night you are looking for. See New York from a different perspective. When you step into the Sky Room you are stepping onto the rooftop of a NY building. 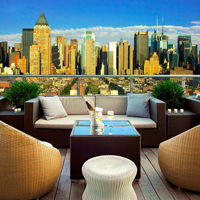 The Sky Room is the highest rooftop bar in New York. The bi-level lounge is divided into five distinct sections for guests to choose from. Although the bar is outside, a comfortable environment is provided year round. There is a retractable glass cover that is used to keep everyone warm during the cold months. See stunning views of the Empire State Building, Times Square, and Hudson River through glass windows as you party over Manhattan. See the complete city from one location. When you are at the Sky Lounge that is what you are able to do. You will truly be in the heart of Manhattan. You do not want to miss out on an opportunity like this. Make sure you visit their website for more information. This will be an unforgettable experience. See New York like never before at this rooftop bar! If you are looking to see stunning views of New York's skyline the best thing to do is to go up onto the roof. At 230 Fifth you will be able to combine amazing views of the city with amazing drinks. 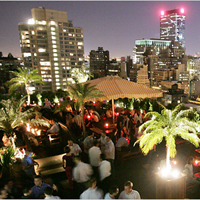 230 Fifth is the largest rooftop bar in NY. Two floors make up this bar, one that is fully enclosed and the other that is outdoors. Oversized umbrellas are readily available for rainy days or for when the sun is too hot. The rooftop is also partially heated during the cooler months. A full food menu is available. 230 Fifth is open 365 days a year. Saturday and Sunday brunch is also served. To see New York in a way you have never seen it before while having a good time, make sure you visit 230 Fifth. Recognized as one of New York's finest rooftop bars, The Press Lounge offers guests one of the best views that can be seen in all of Manhattan. For a small cover fee you will be able to enjoy elegant cocktails, wines, and small food plates. Most importantly you will be able to enjoy the beautiful views of Manhattan and the Hudson. The bar is enclosed by glass walls and the view is completely unobstructed. Come and see New York in a way that you have never seen it before. A dress code is enforced so make sure you check out The Press Lounge's website for more details. 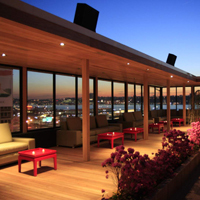 With its amazing urban atmosphere, the Hudson Terrace combines intimate interiors with an all season rooftop bar. 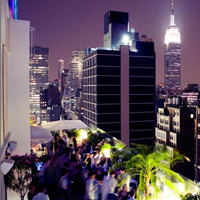 This NY rooftop bar is the perfect location for private events and the nightclub scene. Step outside and see the most amazing views of the Hudson while partying it up with your friends. The beautifully crafted Hudson Terrace bar promises nothing short of an amazing night. See the New York skyscraper light up the sky while enjoying a magical night out. To book a private event check out their website today. When you spent a night at the Hudson Terrace you will have the time of your life. 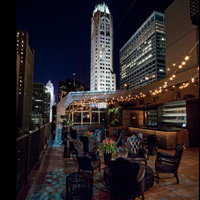 30 stories above the ground, the 3000 square foot NY rooftop bar offers a 360 degree view of the city. Upstairs at the Kimberly has three indoor and outdoor rooms, with retractable glass walls and ceilings and heated floors making this venue perfect during any weather. Most importantly, you will find absolutely beautiful views of the city including the Chrysler Building. Enjoy some cocktails and choose something from the small food menu that is offered every night. The interior decor is as stunning as the views that you will find. Stay inside or venture outdoors, the choice is yours. When you have views as amazing as the ones you will find at Upstairs at the Kimberly, you cannot have a bad time.